Featured above: The picturesque Salt Trail that runs between The Town of Glade Spring and The Town of Saltville. Since joining the HEAL Campaign in 2015, the Town has worked towards achieving goals outlined in the HEAL resolution. The Town has built their Campaign with the community in mind – choosing to engage residents who are eager to provide feedback and assistance to establish a culture of health and wellness in the community. “We’ve made a considerable amount of progress,” said Ms. Williams. “We recently did a needs assessment, pretty much based on what our citizens of Glade Spring want and our next steps.” This assessment helped recognize areas of need – most notably a desire to improve walkability and healthy food opportunities for the community. 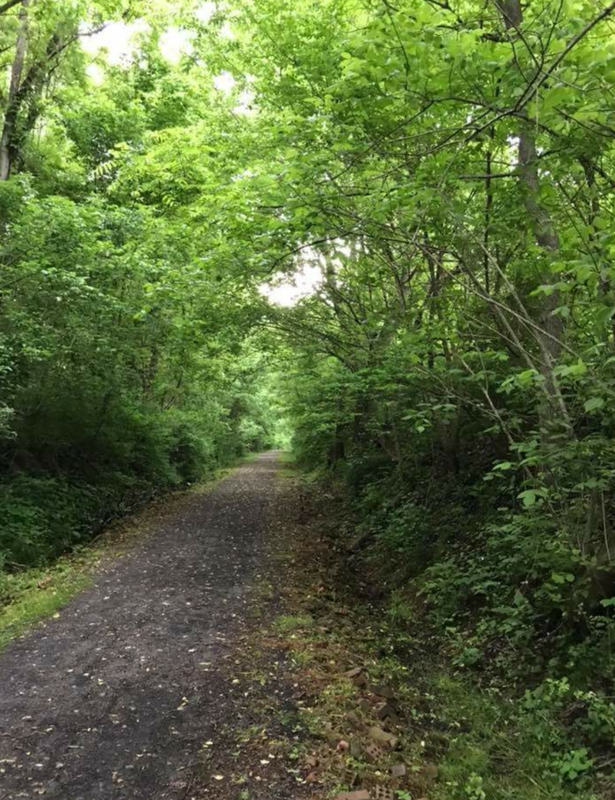 This spring, the town completed a 1.5-mile trail connecting downtown Glade Spring to the nearby Salt Trail, an 8 mile-mile trail that extends to the Town of Saltville. Seeing an opportunity to improve access to the trail, students from a local college helped clear a right of way along the road leading to the trail. “We used to be a really nice walking Town. But we’ve let the sidewalks go…," said Ms. Williams. “We were able to uncover the sidewalk that runs along the highway to the Town Square. We’re real proud of having this safe place to walk to the Trail.” The Trail has been a significant success leading to further opportunities for residents and community members to use the trail for recreational activities and school programing, including a partnership with a local middle school that uses the trail as an outdoor classroom. Recently, the Town completed the construction of an indoor famers market that was made possible through a combination of a few small grants, community fundraisers, and donations. “The community really does donate a lot of time, energy, and effort to making this work,” said Ms. Williams. The weekly market hosts about 20 vendors that, in addition to selling local food and produce, also provide food preservation workshops, meat safety classes, and cooking demonstrations on stoves provided by visiting food trucks. These events are an example of the resourcefulness of the community, as vendors have the opportunity to showcase their products while also providing valuable community activities. The market also runs a food donation program for the local senior center and accepts SNAP (formerly known as / food stamp) benefits for low-income shoppers. The small Town has made significant efforts to promote health and wellness within the community. Tapping into the resources available has been a fundamental component to this Town’s success. Illustrative of this resourcefulness is the Town’s community service database. At every town meeting, participants complete a questionnaire to assess community member’s interest in working on Town projects, initiatives, and volunteering opportunities. “It’s a local database of what people are willing to do. It’s been very helpful in gaining community support” commented Ms. Williams, who initiated the database. Community involvement continues to shape the Town’s progress including new initiatives and activities that are a collaborative effort on behalf of Town staff, elected officials, and community members happy to chip in, however they can.